« #BikeIt: What’s On Your List? The bridge coming into Snohomish for a pastry stop. Our four-day bike getaway to Lake Stevens with side trips to other small towns in Snohomish County checked all the boxes for both of us — quite a trick! We did this trip in fall, over the Labor Day weekend, and based on our experience will plan more trips like this. I briefly considered planning a big loop with a stay in a different town every night. The reality check for my checklist: I was planning this in the last couple of days before leaving and we were heading out on Labor Day weekend so many places were already booked. I opted for a “hub and spoke” design—ride to one place, then go out and back from there each day—rather than the bike touring multi-day loops we’ll explore in the future. We headed out mid-morning Friday, which put us ahead of those taking a 3-day weekend rather than a 4-day — a tactic I’d definitely use again to miss some of the heavy traffic volume of a holiday weekend. 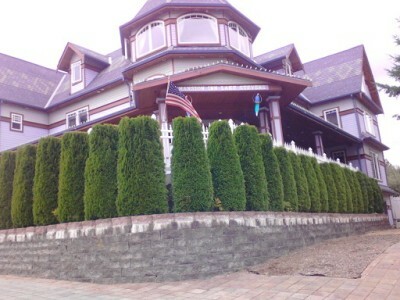 The Mansion Inn Bed and Breakfast in Lake Stevens provided the perfect hub. At around 35 miles from our starting point in northeast Seattle, it was a comfortable distance for me with that all-important pastry and coffee stop along the way in downtown Snohomish, which has lots of wonderful places for flaky confections. Note to hotel owners everywhere: If I had gotten an answer that didn’t welcome us on bikes, we would have gone to a different town. After an easy start on the Burke-Gilman Trail to Kenmore, we rode in new bike lanes for quite a bit of the route to and through Bothell. Alternatively, we could have routed through Woodinville and made a stop at some wineries for tasting. Scroll down for maps for both routes. If you’re starting farther south and need a break along the way, you may want to check out Honey Bear Bakery in Lake Forest Park along the way. See options for routes from downtown Seattle in Seattle to Edmonds: Day Trip to the Salish Sea. For us the ride itself was the primary point of the trip, but I found plenty of reasons to stop along the way if we wanted to. Log Boom Park on Lake Washington: You’re heading to a lake destination but if you want to stop for some fishing or just staring at water and boats, this is your spot. Watch a float plane or two landing or taking off from Kenmore Air, the world’s largest seaplane-based airline, and check out the Kenmore History Walk (PDF). Family biking — playgrounds and toy stores: Log Boom has a playground so if this is a family biking trip, stop here to let them run and shriek and climb on things. If you feel the need for takeaway entertainment, hunt down Snapdoodle Toys after you cross 522 just a little farther on or Toys that Teach in a little mall farther north on the route. Bike to beer at 192 Brewing: This popular stop right on the Burke-Gilman Trail is just north of the traffic light at 73rd Ave. NE, where our route turned off the trail. Lots of outdoor seating. 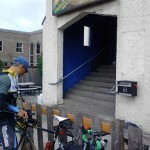 Bothell Bike and Ski: Bike shop on the route in case you need to stock up on anything. Things to do in Bothell, WA: This list of businesses in Bothell will give you more ideas, although remember that pastry awaits in Snohomish. 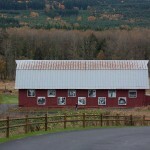 Local farms: On your way into Snohomish you’ll ride some of Snohomish County’s beautiful farmlands. 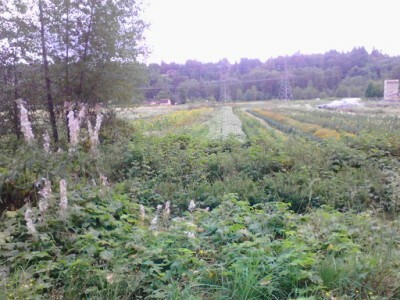 Bailey’s Vegetable Farm was on our route as we came into Snohomish via springhetti Road; we passed by this time but another time would make a stop for some freshly grown fuel. The Snohomish County Farm Trail guide will come in handy (PDF); they have a mobile app that will alert you when you’re near a stop, too. Hot air balloon ride: You’ll have to plan around this, as the best times for ballooning are at sunrise or close to sunset. If you opt for the sunset ride and full dinner from Airial Balloon you’ll have an evening ride on to Lake Stevens but it’s an easy route almost entirely via the Centennial Trail. Skydiving: If you’d like to move through the air but quite a bit faster, go for the thrill of skydiving. 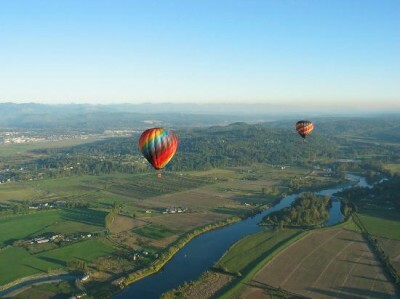 TravelChannel.com named Snohomish one of the 6 Best Places to go Skydiving in the world, the only location named in North America! Bakeries: Snohomish checked off both “cute downtown” (lots of antique stores) and “pastry” (lots of bakeries) on my list—so much so that we made plans to stop there again on our way back. At Snohomish Bakery Creations this first time around Eric’s sandwich on fresh, fluffy bread more than satisfied his hearty race-training appetite and my apple strudel satisfied my sweet tooth, although plenty of other things tempted in that case. We didn’t make it to Snohomish Pie Company this time but that was okay — it was on our list for the return. Antiquing: Snohomish’s short downtown stretch invites you to lock the bikes up and walk a while to explore the antique shops and other specialty shops. From Snohomish we rode an easy 10 miles more on the Centennial Trail through quiet pines and past a Little Free Library. As beginning birdwatchers we appreciated the sightings of hawks and a Stellar’s jay, among others. As we came into easygoing Lake Stevens we saw kids swimming in the lake. With rain in the forecast we hadn’t packed our suits, but definitely would on a summer bike tour. The Mansion Inn, which is all of 5 minutes away from a grocery store and a few places to eat and 10 minutes away from the Centennial Trail, made for a delightful stay. Rod and Tracy are welcoming hosts, and with shelves full of snacks available 24/7 they’re more than ready for the hearty appetites bike-touring travelers bring in the door. Rod told us they had been stuffed to the gills for the Lake Stevens Ironman a couple of weeks before, with people willing to sleep on sofas and floors just to have a place to stay. The Ironman is a boon to business for lodging owners, with nothing available for 50 miles around because registration nearly doubled this year. If I lived anywhere along the Centennial Trail I’d be looking seriously at whether I wanted to sign up as an Air BnB host, given the opportunities created by major events like this and the daily attraction of the trail. 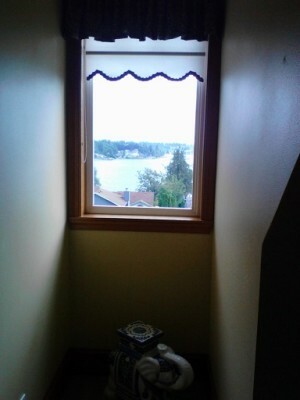 Our room at the top of the inn offered all the peace and quiet we wanted. 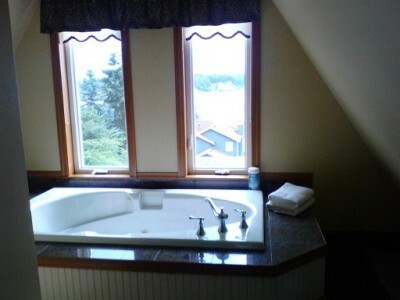 It also featured a jetted tub — I hopped right into that after we unpacked to soak away the mileage. Then it was time to go find dinner. We chose the Adriatica for our first night’s dinner. With fast, attentive service and delicious food, it more than satisfied, although we made the mistake of skipping the baklava so I can’t report on that. Portions weren’t gigantic so if the first day had burned a lot more calories we might have ordered an additional entrée. Soft mattress, smooth sheets, and well-deserved sleep rounded out Day One of our bike trip to Snohomish County. 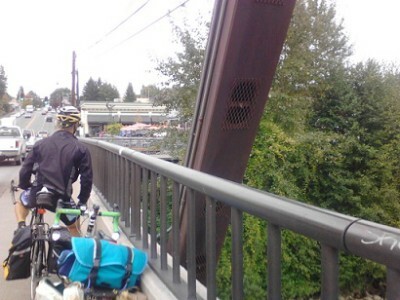 The one dicey part came when the nice bike lane in Bothell ended with us on a bridge over 405 looking for signs. We had to stop to understand a strangely angled curb-cut/sidewalk configuration with cars coming off the freeway on a ramp that we had to cross. This very short segment is not for the faint of heart. In Bothell Google Maps for bikes shows a connection from 23rd Ave SE to Seattle Hill road. It isn’t a street connection; we added a little more mileage thrashing around, asking people who were out for a walk, and pulling out my smartphone for navigation. We should have realized that a Dead End sign means for cars, not necessarily for bikes; Google Street View shows a path that continues at the end of what appeared to be a cul-de-sac on 23rd. If you take this route, you may want to plan time to stop at the wineries and distilleries for some tasting, or check out the protected wetlands around University of Washington Bothell for birdwatching. We came back this way, as I’ll report in Day Four. Distilleries: Craft distilleries in Woodinville offer handcrafted vodka, whiskey, grappa and more. Check out these fine Washington state distilleries: Pacific Distillery, Woodinville Whiskey Company, Soft Tail Spirits, and Project V Distillery and Sausage Co.
Birdwatching: Interpretive trail in 58 acres of protected wetlands at the University of Washington Bothell, one of the largest and most complex floodplain restorations in Washington State. Fall to late spring you’ll see one of the state’s largest area for roosting crows. Hot air ballooning: You’ll have a couple of chances on this trip if you take this route. Over the Rainbow in Woodinville has a post-flight session at Matthews Estate. 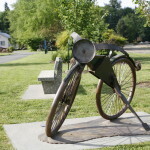 This article was posted in Bothell, Food, Lake Forest Park, Lake Stevens, News, Seattle, Snohomish County, Trails, Travel and tagged bike travel, birdwatching, Bothell, Burke-Gilman Trail, distilleries, food, Lake Forest Park, Lake Stevens, Seattle, wineries, Woodinville. Bookmark the permalink. Follow comments with the RSS feed for this post. Both comments and trackbacks are closed.